Info: 4 Bedroom, 4.5 Bathroom Gulf-front Home with 3900+/- sq. ft.
Oceania condominium, beachfront resort residence for sale in Gulf Shores Alabama. This luxury condo offers 1 unit per floor w/ elevator access directly to your private foyer. This split floor plan has a Gulf front Living, Dining & Kitchen area Enjoy incredible 360 degree views of the Gulf, Lagoon & Gulf Shores from the 9th floor wrap around balconies. 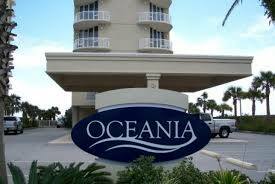 Visit ... Oceania Condos in Gulf Shores AL. Gulf Shores, Alabama is the southernmost community in the state. Gulf State Park occupies a large eastern part of the city. This popular resort community is known for its bright white beaches, subtropical weather and soothing warm waters. Daytime activities include scenic cruises, dolphin-watching and hiking. A great place for families, Gulf Shores has The Track, a family recreation center with bumper boats, and also the Alabama Gulf Coast Zoo. Experience popular Gulf Shores restaurants like Tacky Jacks, Acme Oyster House, Ribs & Reds, Mikee's, Sea-n-Suds, Gulf Shores Steamer, etc. and enjoy some of the freshest seafood anywhere. There's no shortage of Gulf Shores lodging options, from vacation rentals by owner, to luxury hotels and beachfront condos & house. Whether you’re ready for fun and adventure, a relaxing day on the beach, tasty seafood cuisine or your own Gulf Shores beach home - you can find it all on Alabama’s Gulf Coast.